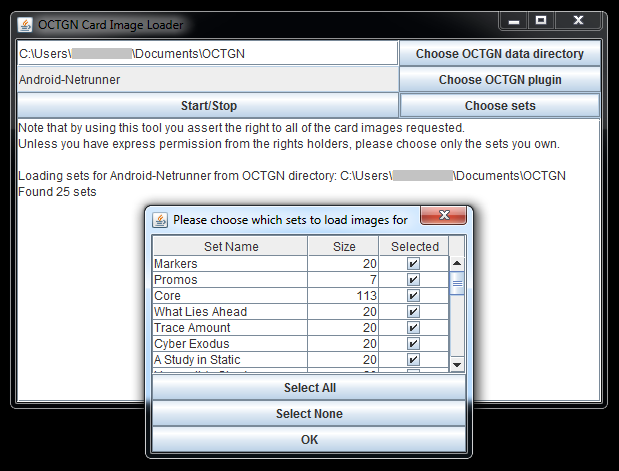 This checks your OCTGN game directory for cards, then downloads images for cards that are there and available on netrunnerdb. You can also limit which sets to process. There are a few of these now, but I forgot to put this here earlier so here you go. Do send requests if you want me to support other OCTGN plugins with APIs, or let me know if you want changes. Thanks for posting this here, and thanks for working on this. Always helpful to have easy access to an image download tool. This is really great. Thank you for posting this. Already have it and used it. Fantastic program. It’s awesome to finally have alt-art cards in OCTGN. And it works for Doomtown:Reloaded as well? Great work mate! It’s awesome to finally have alt-art cards in OCTGN. I’m afraid my tool doesn’t do that yet, if you think it’s worth it I might be able to add an option for it. Any ideas for where I should get them? And it works for Doomtown:Reloaded as well?